When someone is rude to you, it is easy to sink to their level and respond with harshness. However, if you do that, you speak to your own character, and everyone can see that. You don't win, you lose, and the other person wins. Better to ignore it and chalk it up to experience. If someone is rude to you, they are not worth your time or trouble. 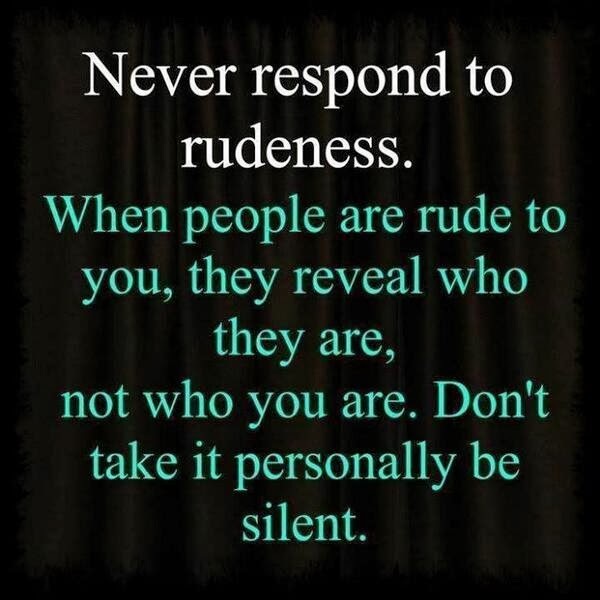 Don't dignify their rudeness with any reaction, which is what rudeness is all about anyway - provoking a reaction. Remain silent and smile. Upon reflection later, you will regret any direct response that you offer - either it wasn't loud enough, or too loud, or it was too cutting, or not cutting enough. You'll inevitably come up with a better comeback hours later. Anything you do at the time, you lose. Just smile. Even with them a nice day if you are in the mood. Then, move on to people that matter, because the rude one no longer does.